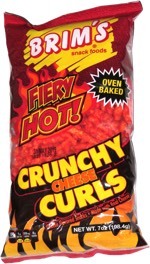 Taste test: I thought the concept here was kind of strange. 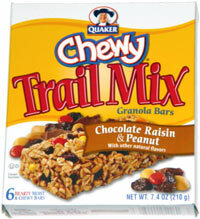 Way back in the 70s, when granola bars were first introduced, they were pretty much trail mixes shaped like bars. Over time, as more and more flavors have come out, they've gradually come to be more like candy bars. Now Quaker has introduced some "trail mix" flavors as if it's a whole new idea. This bar consisted of oats, Rice Krispies, yellow and red M&Ms, chocolate chunks, peanuts and raisins. I don't think the M&Ms were official M&Ms, as the package wasn't branded that way and I didn't see any M's on them. I thought it was pretty good, as raisins, peanuts and chocolate are a nice combination. Smell test: Peanutty and chocolatey. Pretty good.